This page highlights some of the neat things people have done with JMRI Panelpro and JMRI Libraries. The Essex Belt Lines group is using JMRI to add signalling, including CTC, to their large modular layouts. There was a nice writeup in the Fall 2016 issue of the OPSIG BR eNews. Kent Williams' Oregon Washington Navigation & Railway (now dismantled) used PanelPro for it's signal controls and dispatcher panel. Jim Thompson is using PanelPro to make a dispatcher's panel for his Cashaway Valley Railroad. He has a series of pages that describe how he operates his layout with JMRI. Bob Bucklew built a realistic CTC panel for his Quaker Valley Railroad. He's created a very nice series of web pages on how it's done. 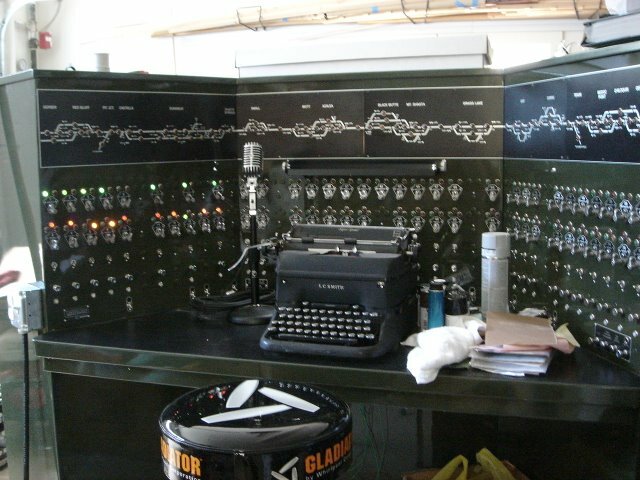 Alan Huberty created a multi-screen control panel for his Bloomfield & Oakland Railroad. The goal of Otis McGee's SP Shasta Route is prototypical fidelity to 1952 operations. At the time, the railroad was run from a CTC machine at the dispatcher's office in Dunsmuir, CA (see photo to right). To recreate that, Otis has installed a rebuilt United Switch and Signal CTC machine on his railroad (see below). PanelPro controls the machine and provides CTC control for the layout via a large seven-node C/MRI installation. Egbert Broerse's Durenver & Silverton Railroad panel was made using Panel Editor and is displayed on a compact LCD monitor by JMRI PanelPro 2.4.1 on OSX 10.4.6, the last version supported by the MacMini hardware.The graphics on the panel match a generic (US-built) Entrance-Exit (NX) CTC machine, in use from 1950 until the mid nineties. However, most turnouts are operated with an Individual Function Switch (IFS); see the Signaling Wiki. Egbert started by drawing a compact track schematic in 4 pt white lines on a black background. Location names and block boundaries were added to help in the orientation of the dispatcher. Icons from the Small LED schematics group were added to show track occupancy and Medium LED icons display and control the current state of lighting etc. Turnouts in hidden trackage are monitored using Infrared detectors, shown on the panel, supported bij audio signals produced by JMRI. Later, signals were added on the layout as well as to the panel (below, center). All logic is controlled as Signal Mast Logic following a customized Rio Grande 1965 Rule Book signal definition. Physical control panels on the layout fascia sport the same graphic style, be it black on yellow (below, right; 3 images © EJB as CC BY-NC-SA)). Electromechanical interlocking equipment wikipedia is widely used in Europe and North America. The Siemens & Halske 1912 model was first put into operation in 1894 in Prerau at The Emperor Ferdinand Northern Railway in the Austro-Hungarian Empire (now Přerov in the Czech Republic). In later years, this device was manufactured by more than one company. JMRI provides a look of appearance produced by Elektrosignal Praga – ESP for Czechoslovak State Railways - ČSD. Description of deployment in PanelPro is here https://sites.google.com/site/sidloweb/jmri/09-panel-editor. The Cedar River and Iowa Central Railway (Crandic) has a great "Dispatching on the Crandic" video, along with several others, available for download. The Crandic's control program and dispatcher panel called CATS was built by Rodney Black on top of the JMRI libraries. He's kindly made it available as open-source software to anybody who wants to use it. CATS is used on John Parker's BNSF Fall River Division for their dispatcher's panel. 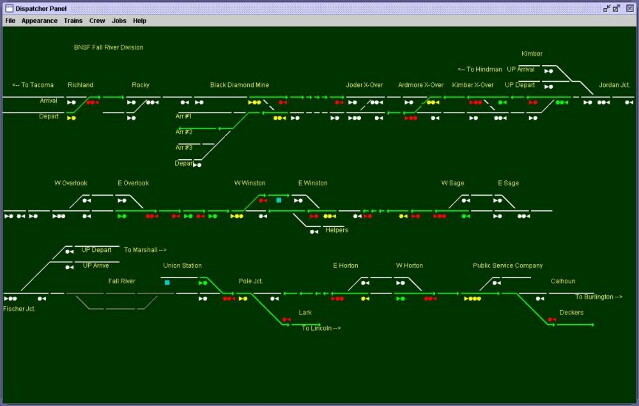 The Model Railroad Manager software provides inventory, operations, maintenance and layout control programs for model railroads. The layout-related parts are based on the JMRI libraries.